The Skicircus is one of Salzburg′s official travel destinations and comprises of three communities: Saalbach-Hinterglemm, Leogang and Saalfelden. 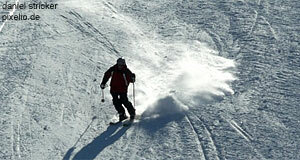 All three of them are among Austria′s most popular ski resorts. Combined, the Skicircus draws more tourists to the Alps of Salzburg than the city of Salzburg does. The Skicircus has a reputation for being a party hub and is famous for its après ski traditions. The area comes with 200 kilometres of managed slopes and more than 60 ski lifts. That being said, the bi-seasonal nature of the area is somewhat distorted through the winter sports, since most money is made during the skiing season. During the summer, you might find a bargain deal in one of the many enormous and opulent hotels of the area. The Skicircus Saalbach-Hinterglemm/Leogang, as it is often called, targets mostly young people. They often come as package skiers from Germany, the Netherlands or the United Kingdom. The Skicircus Saalbach-Hinterglemm / Leogang has a reputation for being a very innovative skiing area. In the past 10-odd years, 190 million Euros have been invested in the local infrastructure. This went primarily into new ski lifts and snow guns as well as artificial lakes, which supply water for generating snow. The investments have resulted in several awards that the area won in the past years - and almost guaranteed snow, even though it′s not necessarily natural snow that you will be skiing on. During the summer season, the Skicircus tries to turn into a hike circus and copies marketing ideas from various towns in Western Tyrol - organising "hip" sport events, such as mountain biking races and more "unusual" sports. There are concerts of contemporary music, parties and outdoor club events held. Mountain biking in particular has proved to be somewhat successful in drawing the young and fun-oriented crowd that knows the region from the skiing holidays back to the valley.